Peter Lang » Blog Archive » Private Conversations in Public Places #1. Private Conversations in Public Places #1. 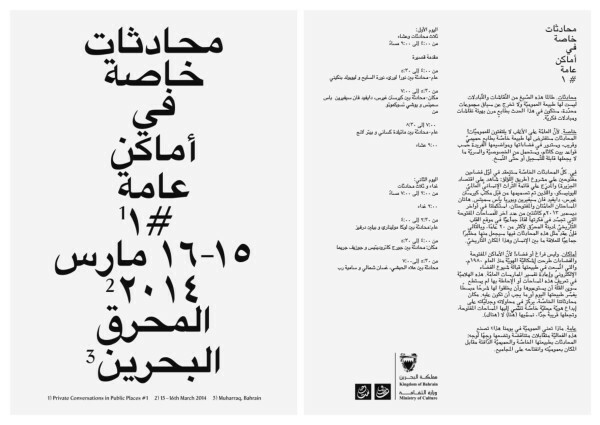 Private Conversations in Public Places #1, 15-16 March 2014: Muharraq, Bahrain. Private. Because, more often than not, the public doesn’t care. The conversations will assume their private nature and even attempt to be intimate. They will be held according to the Chatham House rules and will not be filmed nor re-transcribed. Conversations. Since the conversations have no ambition of being public, they will attempt to provide a flexible format of discussions and exchanges. In. The talks will be held in two of the first completed public squares of the Pearling, Testimony of an Island Economy UNESCO World Heritage site designed by Office Kersten Geers David Van Severen and Bureau Bas Smets. Completed in late December 2013, they are part of the very few planned public squares to be introduced to the heart of historic Muharraq in more than 20 years and are therefore experiments that can be taken as case studies for the conversations. Public. What is public today? The conversations are imagined as a confrontation between the private nature of the event and the public ambition of the place. Places Not spaces. Because public space has been having an identity crisis since the 1980s. Further aggravated by the invasion of the internet and its redefining of public practice, few people can give a simple explanation as to what public space is today or what it’s supposed to do. Place, puts an emphasis on the attempt to create a specific local identity and in defining the here as different to there.